Gavin Ramos (l) and Tony Martinez await the game-opening Fort Frye kickoff in last Friday’s regional semifinal football playoff game. Northmor lines up before scoring a touchdown to take an early 8-0 lead over Fort Frye on Friday. In a rematch of their first ever playoff game last year, Northmor took on Fort Frye in the regional semifinals Friday night at Watkins Memorial High School on a frigid night. The Golden Knights struck first in the contest — a welcome sight after falling 6-0 in 2017 — but were then forced to watch the Cadets control the majority of the game in claiming a 41-23 victory that ended Northmor’s season with a 10-2 record. Northmor had their most success offensively on the game’s first drive. After returning the opening kickoff to their 37, the team immediately got an 18-yard run by back Conor Becker to take the ball into Cadet territory. After two more Becker runs moved the ball four yards to the FF 41, quarterback Hunter Mariotti hooked up with Blake Miller for a seven-yard completion for a first down. Becker then ran for seven more and Mariotti would record his second completion, this time to Gavin Ramos for 26 yards to place the ball on the one. While the Fort Frye defense held firm for two plays, the third time was the charm, as Becker dove across the goal line for a touchdown. Mariotti connected with Chris Bood for a two-point conversion and the Golden Knights led 8-0. Unfortunately for Northmor, it wouldn’t take long for Fort Frye to respond, as they went 61 yards on eight plays, all on the ground. While a 37-yard run by Brian Adkins did much of the damage, it was a one-yard scramble by quarterback Tate Engle that got them on the scoreboard. A two-point attempt failed, though, allowing Northmor to maintain a lead at 8-6 with 4:09 left in the opening period. The defenses took over until the middle of the second quarter. Northmor’s next three drives all ended with punts and the team only getting one first down in that span on a 15-yard Becker run. Meanwhile, the Cadets had their next two drives end via a punt and an interception by Ramos. However, on their next drive, they got the ball on their 22 with 8:13 left and were able to put together a long drive that resulted in a score. Running backs Evan Schob and Tyler Fisher did most of the work, consistently moving the ball down the field. Fisher wound up scoring at the 3:02 mark and added a two-point run to give FF their first lead of the game at 14-8. After forcing another quick punt, the Cadets almost added more points, as they went from their 30 to the Knight 13 in under a minute. Fortunately for the Golden Knights, they were able to force an incompletion on fourth-and-five to put an end to that threat. However, the Cadets started the second half where they left off in the first. Taking the ball on their own 20, it looked like the team’s drive would stall on the 39 when Northmor forced a punting situation. Punter Isiah Jones had trouble handling the snap, saw a hole, and took off running for a 15-yard gain that gave the drive new life. From there, the Cadets ate up yards on the ground and wound up scoring on a quarterback sneak from the one to lead 20-8. 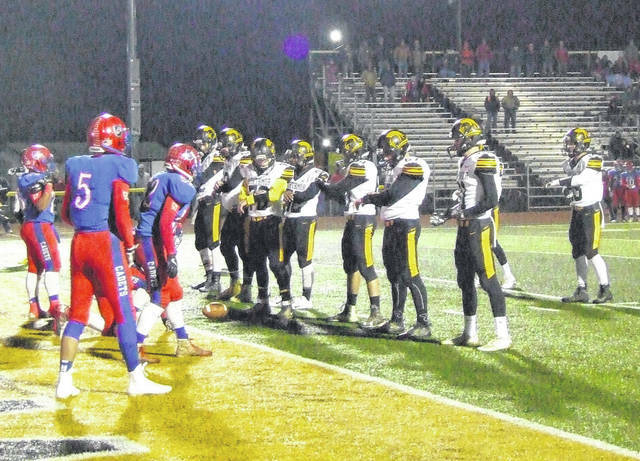 Fort Frye would then essentially put the game away, holding Northmor to three-and-outs on their next two possessions and responding with touchdowns. Zane Greenleaf put points on the board with a 13-yard run and Engle connected with Adkins for a 58-yard scoring pass. Engle added a two-point conversion on the latter touchdown to make the score 34-8 with 9:07 left in regulation. Northmor was able to stop the bleeding on their next drive, getting a pass from Mariotti to Becker that went for 51 yards to set up a seven-yard scoring pass from Mariotti to Becker. Becker’s two-point run brought the Golden Knights within a 34-16 margin. The team would not get any closer, though. Fort Frye responded with a six-play drive ending with a touchdown by Fisher to go up by 25 points. While the team got a 19-yard scoring pass from Mariotti to Cole Dille followed by Nate Ruhl’s extra point kick to make it 41-23, they would not be able to catch up in the game. Armrose noted that his team simply struggled to both get Fort Frye’s offense off the field and keep their offense on it. Mariotti completed 12-of-19 passes for 154 yards, with Ramos catching four for 54 yards and Becker adding three for 54. Both Dille and Miller caught two passes and Bood hauled in the remaining completion. Becker added 64 rushing yards. 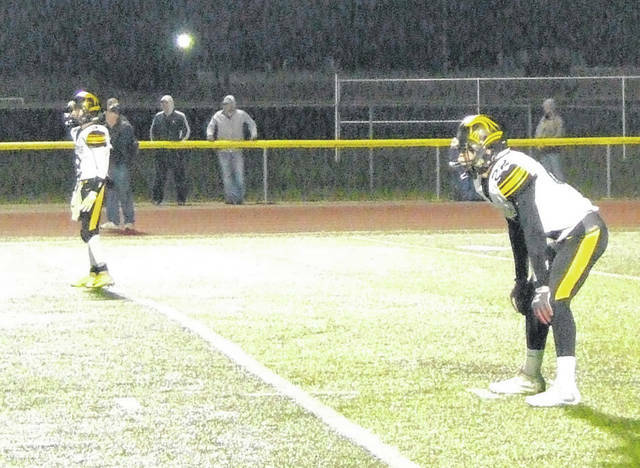 https://www.morrowcountysentinel.com/wp-content/uploads/sites/29/2018/11/web1_gavinramostonymartinez.jpgGavin Ramos (l) and Tony Martinez await the game-opening Fort Frye kickoff in last Friday’s regional semifinal football playoff game. https://www.morrowcountysentinel.com/wp-content/uploads/sites/29/2018/11/web1_before1sttd.jpgNorthmor lines up before scoring a touchdown to take an early 8-0 lead over Fort Frye on Friday.